He's not just a man; he's a spider man. 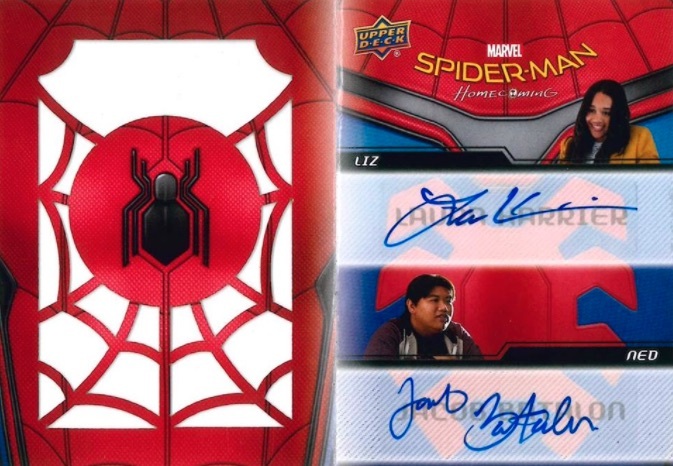 2017 Upper Deck Spider-Man Homecoming takes collectors on a ride with a teenaged Peter Parker, played by Tom Holland, and some pretty impressive friends like Iron Man. The Upper Deck Entertainment release mixes a detailed base and insert set, with a trio of hits expected in every hobby box. 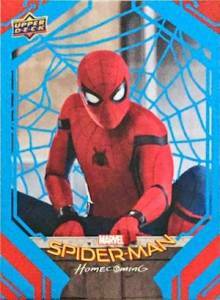 Bridging the Marvel Cinematic Universe, the Spider-Man: Homecoming timeline starts just months after the events of Captain America: Civil War, which has its own Upper Deck card product. With a detailed look at the film, 2017 Upper Deck Spider-Man Homecoming sticks with the other UD Marvel movie releases. This includes a comprehensive base set totaling 100 cards with shots from the film. In addition, there are four parallels that combine to fall in each pack, including Silver Foil (1 per pack), Red Foil (#/199), Blue Foil (#/99), and Black Foil (#/49). There is also a very simple (and different) retail version at Walmart locations, but these are easy to distinguish as the base set numbering includes an RB prefix. Several inserts are available, also averaging one per pack. Among the options are Behind the Lens, Friend or Foe, Spider-Man Decathlon, Spider-Men, and Spider-Tech. 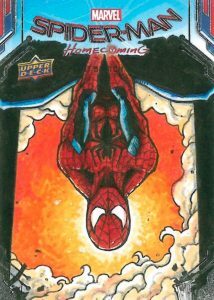 Tapping into the more valuable part of the release, 2017 Upper Deck Spider-Man Homecoming contains several premium hits per box. 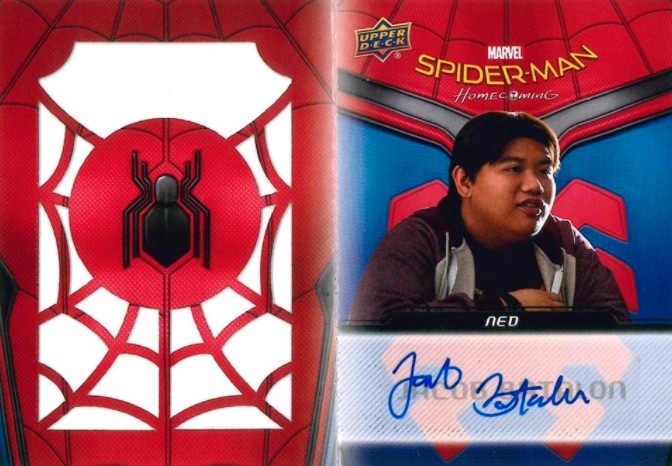 Actor Autographs come from the stars of Spider-Man: Homecoming in Single and Dual form. 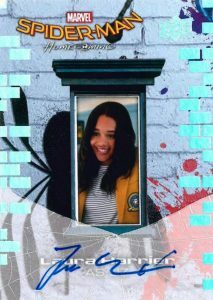 There are also Single/Dual Autograph Memorabilia cards. A new addition, the Spider Booklet Autographs insert pushes the signed cardboard to the next level with Single versions numbered to 100 and Dual editions limited to 10 copies. Meanwhile, hand-drawn Sketch cards provide artistic interpretations of the key characters. 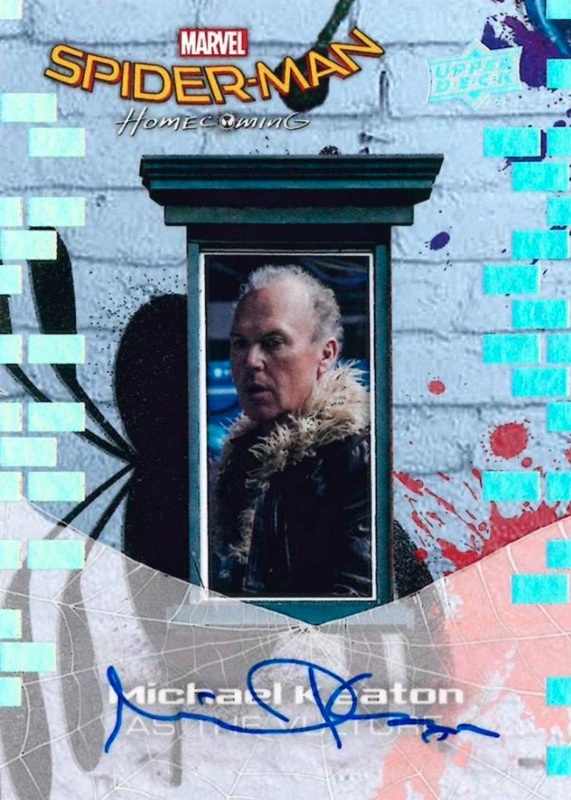 As the main hit, autographs and sketch cards combine to average one in every box. 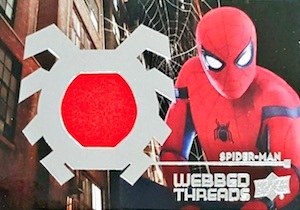 Other hits include Webbed Threads memorabilia cards that showcase actual relic pieces from items used in the film. These come two per hobby box and offer Single, Dual, Triple and Quad options. Pack odds below all apply to hobby (h) and ePack (e) formats unless noted otherwise. Spider Sightings (#91-100) - 3:5 hobby/ePack packs. PARALLEL CARDS: Silver Foil (5:6 h/e), Red Foil #/199, Blue Foil #/99, Black Foil #/49. Overall odds - 1:13.3 hobby/ePack packs. Specific group odds noted below. 10 cards. 1:960 hobby/ePack packs. 10 cards. Serial numbered #/100. Shop on eBay. Overall odds - 1:10 hobby/ePack packs. Specific group odds noted below. Overall odds - 1:20 hobby/ePack packs. Specific group odds noted below. Overall odds - 1:40 hobby/ePack packs. Specific group odds noted below. Overall odds - 1:60 hobby/ePack packs. Specific group odds noted below. Overall odds - 1:160 hobby/ePack packs. Specific group odds noted below. Overall odds - 1:480 hobby/ePack packs. Specific group odds noted below. 7 cards. 1:7.5 hobby/ePack packs. Shop on eBay. 11 cards. 1:7.5 hobby/ePack packs. Shop on eBay. 9 cards. 1:7.5 hobby/ePack packs. Shop on eBay. 77 artists. Shop on eBay. Sketch cards odds - 1:90 hobby/ePack packs; 1:1,000 retail. How did they make this set without having Tom Holland’s autograph in it at all? He’s the star, without Spider-man there’s no Spider-man movie or cards.